You do not say whereabouts in the country you are and I don't see any photograph to enable identification. However, the likelihood of your bites being caused by any spider is extremely small, and in any case, despite what the media would have the general public believe, Britain has no dangerous spiders, and the dangers of very few worldwide are massively exaggerated. 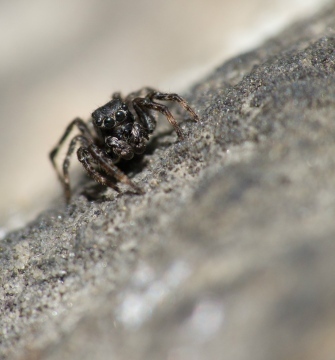 For authorative information on the toxicity of spiders Worldwide see Ed Nieuwenhuys's link on the demystification of the toxicity of spiders . 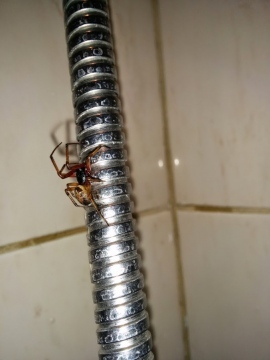 You will note that Steatoda spiders of any species are not even mentioned, except as confusion species for Latrodectus black widow spiders, which do not occur in Britain. For more information on 'false widow' spiders (by which the media actually mean the so-called 'noble false widow' Steatoda nobilis) please see the false widow page on this website, Buglife information and BAS website . 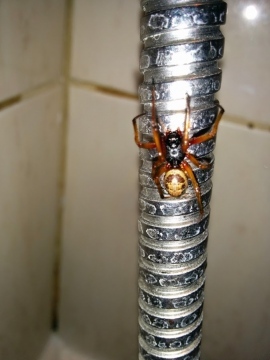 Even if the spiders present in your home include Steatoda nobilis, this species has been frequent in the southern coastal counties of England for a very great many years without causing any problems and is nowadays frequent in many areas of southern England. The media frenzy caused by this spider is unwarranted. They are unobtrusive, have no interest in attacking humans and would only bite if they were put into a position where they do so as a defensive reaction. Honey bees and social wasps pose a far greater risk. PLEASE NOTE, WE CANNOT PROVIDE ADVICE ON REMOVAL OF SPIDERS OR ANY FURTHER ADVICE THAN ALREADY AVAILABLE IN THESE LINKS. Hi there, I have now been bitten for a second time in the space of a month whilst sleeping in my spare room. Last weekend I found I spider that matches the description of a false widow (I will Upload shortly), I did the humane thing and took it to the end of the road and released it but am now concerned there are more in the room due to a second bite. I'm not afraid of spiders nor irrational in this matter, my bites have been sore, caused a lot of swelling and required a course of antibiotics on both occasions so I would argue they are rare. So to my need for advise, I have a tenant moving in on Sunday, I don't want to alarm her but have not been able to find any other spiders, I would hate for her to be bitten also (I doubt she is as understanding as I am toward the situation). The bites have occurred at night when sleeping in the bed, reading about Spider bits it's sounds like it's only ever in defence, which makes me question where they could be coming from. The room was stripped and redecorated only 3 weeks ago, brand new paint and carpets so very clean. the bed is beside the window which makes me think they may be coming in at night. Alternatively the radiator is full of dust and also at the end of the bed which may be where they are hiding. What can I do, what should I look for? I want to be assured this is very very unlikely to happen again and at present am not confident it won't. Yeah sorry, doesn't read well, what i meant was when I posted it on the Facebook page, someone said they thought it was this and suggested I register the find with you, which i wanted to do, but thought better check the ID with you first as I wasnt 100% sure if the identification was correct, and I was basically saying that it now seems this guy wss correct. Can I now ask though if this will be registered as a find of this species ? I've read up a little bit about this and understand it is thought to be in early colonisation, can I ask how long a spider needs to be living and breeding here etc before its classed as classified as being colonised ? I really appreciate your help and time, and apologise for the poor quality of the pictures .... Unfortunately, I only had my phone to take the picture with ! I don't understand you post Mark. I have said that it looks to be Zoropsis spinimana, exactly as you now say someone suggested on the British spider identification page (other than the typo in Zoropis). I have pointed out that this is however an assumption from a photo, since there are other European Zoropsis species which look very similar, but the identification is 99% likely. This spider has moved into the London area and Sussex in the last few years, see the page here on this website. As far as it is possible to tell from any photograph this is Sabacon viscayanum. There are other European Sabacon species, so there cannot be any complete absolute certainty without a specimen. Can you provide location and date details for the record, with an Ordnance Survey grid reference please. Hello, I've taken another photo. Hopefully this is a better quality for an ID. Male palps are not visible, but you can't tell whether from the photo if it is an adult female or not, so could be either juvenile, subadult or adult. You need to upload and post the picture here. If you sent an email through the contact us page, then you will have received a reply straight away. It may get identified by your ISP as spam, so look in your spam emails. However no message has been received. How did you send a message? You do not need to register to send a message. Hi I took this picture yesterday the 21st of September 2014 and posted it on the Facebook page, British spider identification. I was thinking that it was a particular species and was just confirming that i was correct in thinking that it was a female, and was informed that the person who commented believed it to be something else, and that i should provide you with the information, so not being 100 % sure of the id I would like to ask you to confirm it's ID and register it if of use. I did sent a message yesterday after registering with you, and was waiting for an email requesting a photo, so hope it's ok to do this, this way. Hi I took this picture yesterday the 21st of September 2014 and posted it on the Facebook page, British spider identification. I was thinking that it was a particular species and was just confirming that i was correct in thinking that it was a female, and was informed that the person who commented believed it to be something else, and that i should provide you with the information, so not being 100 % sure of the id I would like to ask you to confirm it's ID and register it if of use. I did sent a message yesterday after registering with you, and was waiting for an email requesting a photo, so hope it's ok to do this, this way. sorry the post code for this find is kt8 2eb which is in West Molesey, Surrey. Your spider is the garden spider Araneus diadematus, completely harmless to humans. These mature in late summer, when they become much more obvious in gardens, sometimes with very large webs. They are also extremely variable in colour and depth of pattern. Thanks for location details. Could you tell me what this spider is. It is our work Garden WA4 2PR. 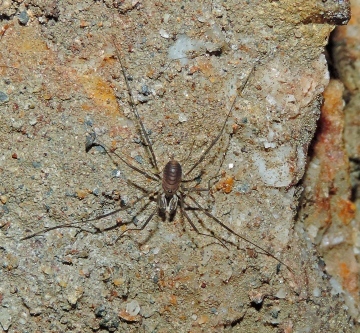 Unfortunately although your spiders are probably Meta menardi, you cannot positively distinguish this cave spider from its scarcer relative Meta bourneti without microscopical examination of an adult. Our knowledge of the distribution of Meta bourneti is blighted by past assumptions, even by some arachnologists, that cave spiders are always M. menardi. I opened 2 telecom cable chambers today and was initially shocked at what i found inside. i observed approximately 10 large spiders and several egg sacks with signs of spiderlings inside suspended from the lid of the box. The 2 chambers are connected by duct under a road. I was unfamiliar with the spider and was careful not to disturb them. A little research tonight and i can positively identify them as Meta menardi. I have also noted that there is little of the way of recorded sightings in this part of the country. The spiders retreated away from the light into the ducts as i opened the chambers. sorry no photo taken this time. Please provide the evidence of Steatoda nobilis north of the SRS website mapped distribution. It is astonishing what house and garden spiders get misidentified as Steatoda nobilis. This is a spider of warm climates, and I fail to see why it is surprising that it is only gradually making its way north as climate change continues to impact on our fauna. Synanthropic species are still restricted by climate and temperature. If Steatoda nobilis is already in Scotland, we should all be very worried indeed - about climate impacts on our civilisation, not the spider. Perhaps the Media can make headlines about that instead of the silly misinformation about the supposed dangers of spiders and false widows. Your spider will almost certainly be more than one moult away from adulthood, so juvenile rather than subadult. 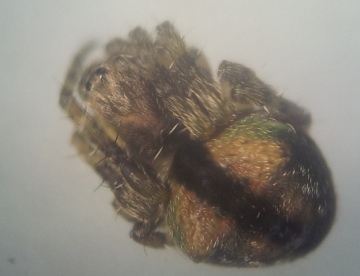 Gibbaranea is an extremely variable spider, but your photo resembles one of the fairly common patterns found in juvenile Agelenatea redii, another very variable spider, especially as a juvenile, although what can be seen of the shape in the photo does seem to suggest Gibbaranea. It is a good example of variation found in some species and more often in juveniles than adults. I am surprised to see that Steatoda nobilis hasn't officially been recorded from Scotland yet - I've had several pictures from North of the wall that have come to my attention that are certainly this species. I'd be absolutely stunned if this synanthropic can't be found in most major Scottish cities - at least, with a bit of looking. Anyone seen anything like this before? I presume its Gibbaranea gibbosa (sub-adult) but I couldn't find anything about striped colour forms, or partial melanism. From Pig's bush in the New Forest. It is very unlikely indeed that you would have Steatoda nobilis as far north as Cheshire, but you need to upload the picture if you want an answer. Picture upload is on the toolbar available to all logged-on users at the top. To place a picture in the forum, you first upload it using picture upload. It is then available for you to use, and will be shown as a picture icon just above the text box when you do your post. Clicking on this inserts the image into your post where the cursor is placed. I spotted this monster on my bike shed yesterday - had to shoo it off as I was painting. okay - no idea how to upload a picture into this post. Could somebody explain how I do it please. I can see that I can upload elsewhere but to get an identification I'm told to upload it to the forum - here I am but no upload button? Certainly looks likely, but need to see more of the spiders such as top of the abdomen. It is difficult to see sufficient details of the palp from photographs (usually impossible for many species), but there might be the large process of male Sitticus pubescens visible. This would be a very late date though - this is usually a spider adult earlier in the summer, especially males. The female may or may not be adult - one can't be sure without being able to identify a fully formed adult epigyne, something which will not be visible in any photograph of a live Sitticus. Can you please provide a full postcode or Ordnance Survey grid reference and an actual date for your spiders. 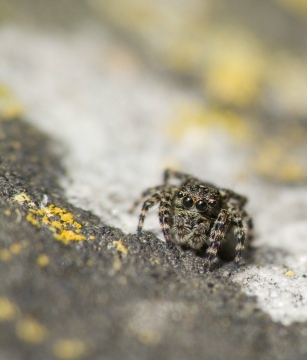 I think I may have a male and female Sitticus pubescans here but unsure, taken in Glasgow on an old canal wall in September 2012. Seams to be a bit far north for the species? I would certainly say it could be, but I don't think what one can see from the photograph is enough to be absolutely sure. I've been advised via the British Spider Identification page on Facebook to put my finding here. 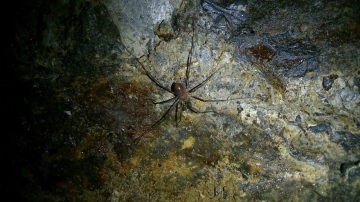 I photographed this Harvestman underground. Could it be Sabacon viscayanum?